WWII to Present. 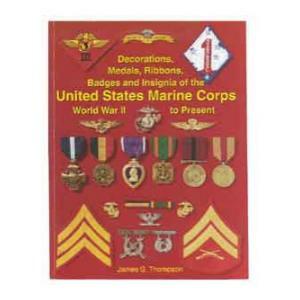 Complete and easy guide to U.S. Marine Corps military medals and decorations with award criteria. Over 30 full color plates including common foreign & U.N. Medals. Presidence of wear for ribbon bars and devices. Identification, skill, and specialty badges, rank insignia, history, display, wear guide and procurement. 124 pages.